In this article I am going to explain how to get documents from data bucket, if you only have partial Id, in other words using LIKE operation of Sql in couchbase by using Views of Couchbase. I have these four documents in my bucket, and I want to get all the documents having starting “abc”, then it must retrieve all the three documents. Then to implement this we can use the View functionality of Couchbase, and then we can fire the query on the view accordingly. 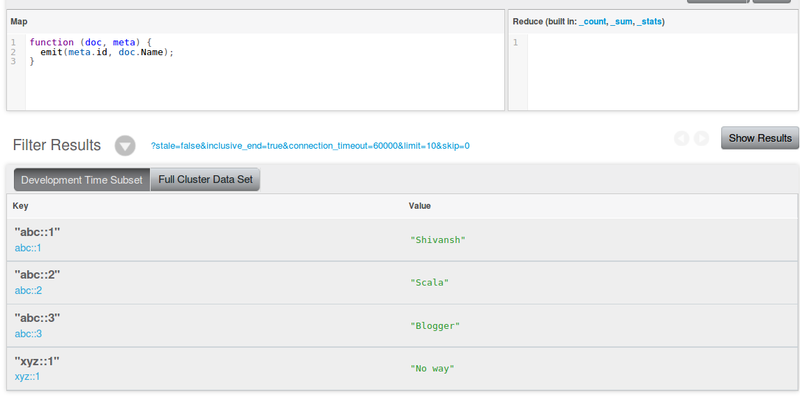 Step 1: Create view on the data bucket, by clicking on create Development View in View option. You can use different functions like emit() in this function accordingly and the list of functions can be found here. Now run the query to get the output having your required value in key and you can perform function startKey() on that. Here startKey(dynamicKey: String) is performed on key returned from that function in view, and stale.FALSE is written so the view gets updated each and every time. Now it returns an object of List[ViewRow] and you can perform different operations accordingly on the result.